Peking cotoneaster, is an upright, deciduous shrub with a rounded top that typically grows to 6-10’ tall and as wide. It is noted for its pubescent twigs, pinkish-white spring flowers, dull green foliage, interesting fall color and persistent black fruits. Small, 5-petaled, white flowers with tinges of pink bloom in spring (May-June). Flowers have limited ornamental value. 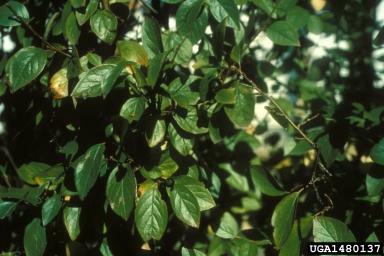 Flowers are followed by elliptic black fruits (3/4” long) that mature in fall and persist into winter. Ovate to elliptic, dull green leaves (to 2” long) are pubescent on both sides in the early part of the growing season. Leaves turn attractive shades of orange and red in fall. Grow in moist, loamy, well-drained soils in full sun to part shade. Good drainage is essential. This is a tough and adaptable plant that tolerates poor soils and can withstand some drought once established. Prune only if needed. Mulch soil to discourage weeds from growing up within the branching. Propagate by stem cuttings or seeds. 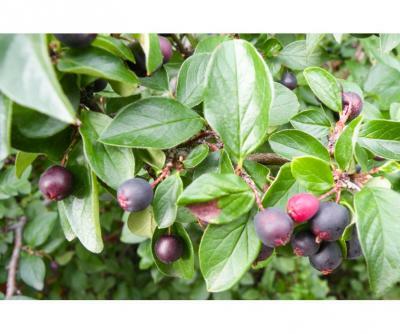 This cotoneaster is an interesting landscape plant that offers good foliage, flowers and fruit. 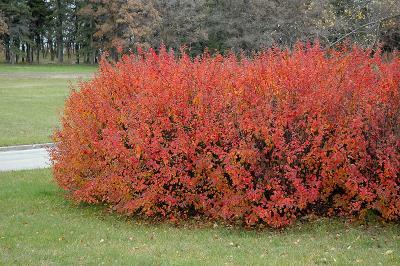 It is not considered to be highly ornamental, but will grow nicely with minimal effort as an informal hedge or screen. Specimen for borders. Group on a slope, bank or wood margin.